Under our new strategic direction, one of CienciaPR’s goals is to grow our infrastructure, human and financial resources to make CienciaPR a sustainable nonprofit organization. 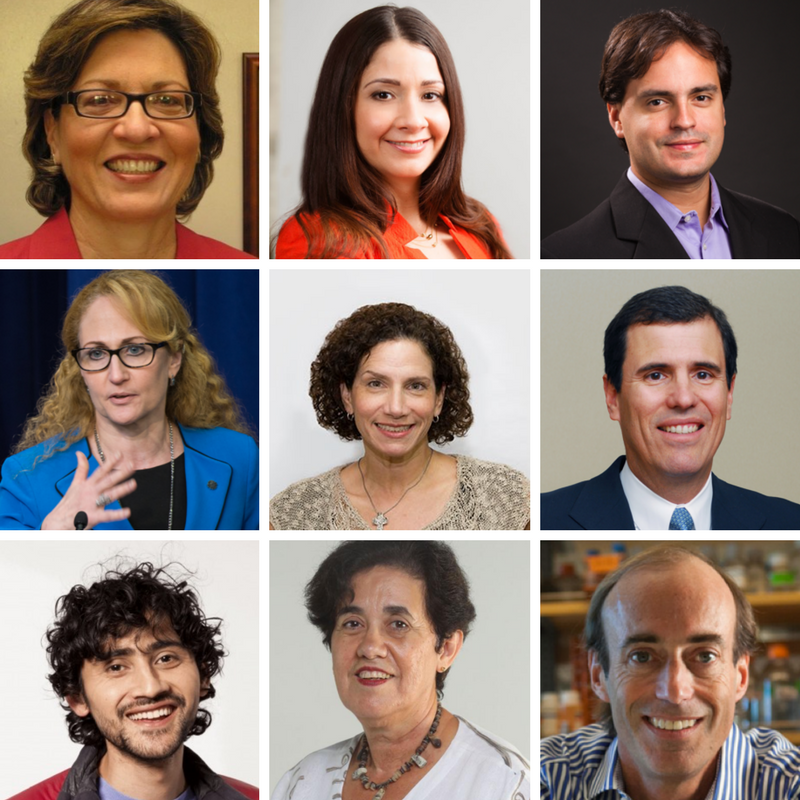 To achieve this, one of our first objectives was to put together a Board of Directors composed by leading scientists, educators, innovators and members of the community that could complement our existing expertise, help us secure new sources of funding, and increase the visibility, recognition and influence of the organization, and overall, help us increase the impact of CienciaPR. We are proud to introduce Ciencia Puerto Rico’s new Board of Directors! We are looking forward to working together with these leaders to transform science education and promote a culture of science, critical thinking and problem-solving in Puerto Rico. Josefina Arce-Quiñones, Ph.D. was a Professor in Department of Chemistry of the University of Puerto Rico, Río Piedras from 1978 until her retirement in 2011. For most of her career, her work focused on chemistry and science education at all levels. She is principal author of a General Chemistry Laboratory manual in Spanish published in 2000 by McGraw Hill and has served as Principal Investigator of several projects funded by the National Science Foundation, including the Puerto Rico Collaborative for Excellence in Teacher Preparation, the Puerto Rico Graduate Fellows in K-12 Education Program, the Puerto Rico Math and Science Partnership (or AlACiMa, for its Spanish acronym); and the Puerto Rico Master Math and Science Teachers Programs. Dr. Arce currently serves as science education consultant and is CEO of Agroempresas Atabey, a sustainable agricultural company with a social mission. Frances Colón-Hastings, Ph.D. is the former Deputy Science and Technology Adviser to the Secretary of State at the U.S. Department of State (2012-2017) where she promoted integration of science and technology into foreign policy priorities. In her role as science diplomat, Dr. Colón led the reengagement of scientific collaborations with Cuba and coordinated climate change policy for the Energy and Climate Partnership of the Americas announced by President Obama. Dr. Colón is the founder of Cenadores Puerto Rico, a non-profit that provides a platform for Puerto Rican diaspora and friends of Puerto Rico to strengthen civil society on the island. In 2016, Dr. Colón was named one of the 20 most influential Latinos in technology by CNET. She is recipient of the Hispanic Heritage Foundation’s 2015 Inspira Award and was a 2015-2016 Google Science Fair judge. Daniel A. Colón-Ramos, Ph.D. is an Associate Professor of Cell Biology and Neuroscience at Yale’s School of Medicine. His scientific work has been recognized by a number of awards, including the HHMI-Gates Faculty Scholar award, a Sloan Foundation Fellowship, and a K99/R00 NIH Pathway to Independence Award. Dr. Colón-Ramos is also well known for his work to expand access to scientific knowledge, experiences and careers. In 2006, he founded Ciencia Puerto Rico. His outreach and research work were recognized in 2011 by the AAAS Early Career Award for Public Engagement with Science. He is a Trustee of the Puerto Rico Science Technology and Research Trust. JoE.Handelsman, Ph.D. is a Howard Hughes Medical Institute Professor and the Director of the Wisconsin Institute for Discovery at the University of Wisconsin-Madison, a center for the promotion of transdisciplinary collaborations at the interfaces of research, education, policy and business.From 2014 until January 2017, Dr. Handelsman served as Associate Director for Science at the White House Office of Science and Technology Policy, a position appointed by President Barack Obama. Among numerous recognitions, in 2011 she received the Presidential Award for Excellence in Science, Mathematics, and Engineering Mentoring from President Obama and in 2012, Nature named her one of “ten people who mattered this year” for her research on gender bias in science. She has been author of books on scientific education, most notably ScientificTeaching. María “Baby” Jaunarena, M.A., is Director of Collaborations at the Foundation for Puerto Rico, where she leads efforts to promote sustainable and inclusive economic development strategies around the establishment of an authentic, diversified, and vibrant visitors’ economy. Ms. Jaunarena has extensive governmental and non-profit experience with educational programs. From 2009-2012, she was Education, Culture, and Recreation Advisor for the Office of the Governor of Puerto Rico, where she led efforts to assure Puerto Rico access to federal educational grants, supported specialized public schools and alternative education programs. Prior to this position, she was Program Officer for the Angel Ramos Foundation, the largest private philanthropic foundation in Puerto Rico. She is currently a member of the Award Committee of the Tina Hills Prize, the most important recognition for non-profit organizations in Puerto Rico. Ramón D. Lloveras-San Miguel, J.D. L.L.M. has been President of Popular Insurance LLC, an insurance managing general agency, and of Popular Life Re, a reinsurance company authorized in Puerto Rico, since 2004. He was part of the team responsible for the formation and expansion of the insurance business for Popular since 1997. Prior to 1997 he served as the General Counsel for Pueblo International, Inc., a major supermarket chain in Puerto Rico, Florida and USVI. He also specialized in environmental law at Fiddler González & Rodríguez and served as a law clerk for Associate Justice Antonio S. Negrón García in the Supreme Court of Puerto Rico. Mr. Lloveras is Vice-Chair of the Caribbean Board of Trustees of the Nature Conservancy and is on the Board of Directors of the San Juan Bay Estuary Program (part of the National Estuary Program), a Board he led as Chairman from 2000 until 2010. Manu Prakash, Ph.D. is Assistant Professor of Bioengineering at Stanford University. He is passionate about developing affordable and accessible technologies that can be used for science education, research, and public health in resource poor settings. He is best known for developing the ultra-low-cost paper microscope Foldscope—for which he won a grant from the Gates Foundation in 2012—and Paperfuge, a 20-cent hand-powered centrifuge made of paper and string. He is a 2016 recipient of the MacArthur Fellowship, an HHMI-Gates Faculty Scholar, and in 2015 he received the National Geographic Emerging Explorer distinction and the NIH Director’s New Innovator Award, among many other recognitions. Dr. Prakash holds numerous patents and his research. Ana Helvia Quintero, Ph.D. is Professor in the Department of Mathematics at the University of Puerto Rico, Río Piedras Campus and is Director of Acceso al Éxito (Access to Success) Project, a platform that provides information, training, mentoring, and support to low-income students who aspire to post-secondary studies. Dr. Quintero has extensive administrative service in K-12 and higher education settings. She was Vice President of Academic Affairs of the University of Puerto Rico from 1989-1991, Director of the Center for Research and Educational Innovations of Puerto Rico’s General Education Council from 1991-1993, and from 2001 to 2002, she served as the Assistant Secretary for Academic Affairs of Puerto Rico’s Department of Education. A recognized math and K-12 education policy scholar, Dr. Quintero publishes frequent opinion columns in newspapers and online magazines, and has published numerous books. Ronald D. Vale, Ph.D. is Professor of Cellular and Molecular Pharmacology at the University of California, San Francisco and an Investigator of the Howard Hughes Medical Institute. His graduate and postdoctoral studies at the Marine Biological Laboratory led to the discovery of kinesin, a microtubule-based motor protein. Dr. Vale’s honors include the Pfizer Award in enzyme chemistry, the Lasker Award for Basic Medical Research, and elections to the National Academy of Sciences, National Academy of Medicine, and the American Academy of Arts and Sciences. Dr. Vale is the founder of iBiology.org, a platform that provides free access to videos that make the excitement of science, research training, and discovery accessible to anyone with an internet connection.